We know what a struggle it can be to locate the exact green pin closed socket you need. That’s why we go above and beyond to maintain an amazing range of wire rope sockets right here at Rope Services Direct. Great for jobs in the sailing, fishing and commercial industries, as well as domestically and commercially, green pin closed sockets are outstandingly versatile and simple to use with a spectrum of different wire ropes. They’re designed using high tensile steel with a safety factor of 5 x WLL. They come with a hot dipped galvanised or painted green finish. When there are so many different sockets in front of you, the options can be somewhat dazzling. So why not also have a look at our huge range of wire rope sockets, ferrules and other rope grips too, or contact our expert customer service staff for help. Remember these sockets will need pressing onto your wire rope; we have our own press facilities to do this for you. 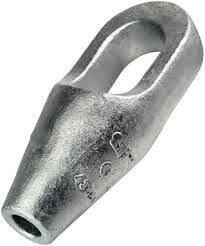 At Rope Services Direct we strive to give the best range of green pin closed sockets for our customers to select from. When you fill in our simple online order form here, our team will work hard to dispatch the part you need as soon as we can. Got a question? No problem! We’re here to help – just contact us direct on 01384 78004. Green Pin Closed Socket Overall rating: 5 out of 5 based on 6 reviews.